Vantus Prelius is an Imperial knight, and a member of the Leyawiin Fighters Guild. When you first meet him, however, he and two of his associates, Dubok gro-Shagk and Rellian, are being drunk and disorderly at the Five Claws Lodge, because all the good jobs are being taken by the Blackwood Company. You will have to help find them something productive to do. He wears a complete set of steel armor and has a silver claymore for combat. Besides this he carries a small amount of gold and a pewter mug. Vantus has the ability to use a leveled set of knight spells. Approaching Vantus as part of your investagation into the disorderly Fighters Guild members causing trouble will have him say: "You're being rude." Speaking to him will have him greet you with a mild threat: "It's not wise to interrupt us in the middle of our discussion." Asking him about why he's causing trouble will have him explain his group's job trouble: "I don't think so. I'll tell you what real trouble is. It's trying to pay my debtors when there's no work. It's my wife taking in wash to buy food. That's been the state of things since the Blackwood Company began moving in." If you end a conversation with him at this point he'll once again suggest that you leave them alone: "Can't you take a hint?" Asking him about Blackwood Company will have him voice his opinion on the group while giving you some background information on the organization: "I spit on them. Mercenaries sent by the Emperor to reclaim territory in Black Marsh. When they failed, they came back and set up shop. They've been undercutting us on contracts ever since, and they've no qualms about accepting jobs no guild member would be caught dead doing." You'll be given two options as to how to proceed. You can either demand that they stop, or you can suggest that they find more work. If you choose the former option he'll claim you don't have the authority to tell him what to do: "Oh? We must? Well, last I saw, you didn't outrank me, Associate/Apprentice/Journeyman/Swordsman/Protector. I suggest you mind your manners... and your own business." You'll be given the option to either once again suggest that they find new work, or you can threaten to report them to Modryn Oreyn. If you choose the latter he will say: "Report us? Oh, no. Why, we might never get work from the guild again! And that would be different how, exactly?" Your only remaining option is to suggest that they find new work, to which he will respond by saying: "A brilliant idea! Oreyn only sends his best these days. Tell you what. You go find us some paying work, and we'll happily go about it." Approacing Vantus will have him change his tone slightly as to how he acknowledges your presence: "Do I want to hear this?" Asking him about Fighters Guild jobs will have him claim that he'll take any work you can find them: "Jobs would be great. Too bad no one is giving us any these days. If you can find some work for us, we'll do it." Speaking to him after you've heard rumors that Margarte might have some work for the Fighters Guild will have him change his greeting to: "I've told you what we need. Until we've work, we'll stay here." Ending a conversation at this point will have him say goodbye with the line: "We're done here." Vantus Prelius will shout several different insults at the other bar patrons, the bartender, and you. He'll have the following things to say about Dubok gro-Shagk: "You've never worked an honest day in your life, you stupid orc!" "Go root in the mud, pig man!" "If it weren't for me, you'd be mucking stables in Orsinium!" He'll direct a few remarks at Rellian as well: "You've always been too smart for your own good." "I'm tired of working with you anyway. And you're a lousy swordsman, Rellian!" "When I want your opinion, I'll give it to you." 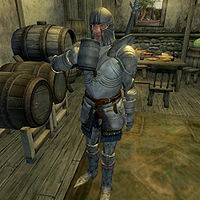 Vantus will occasionly demand refills from Witseidutsei: "How about you send over a few more drinks, sweetheart?" "Barkeep! A refill!" "Hurry it up, swamprot! I'm thirsty over here." Vantus will also constantly tell you to leave: "Get outta here! We don't need you around." "You shouldn't be here." "Mind your damn business, stranger." Once you report to Vantus that you've secured steady work for him and his compatriots he'll gladly accept the new work: "Find ingredients for Margarte, huh? Works for me. I'll let the other men know. Appreciate your help, friend. And Oreyn should be happy." His attitude towards you will change drastically. He'll greet you whenever he sees you by saying: "We're in your debt." Speaking to him will have him happily welcome the conversation by saying: "My friend! What can I do for you?" Asking him about his job situation now will have him once again thank you for your assistance: "My men and I should be able to keep busy for now. Thank you for your help." Ending a conversation with Vantus will have him say, "Much obliged, my friend. ", as you part ways. After the quest Drunk and Disorderly has been completed, he spends his time searching for Ogre's Teeth near Undertow Cavern.